It's easy to draw your own cute, cuddly cartoon rabbit when you break it down into these four easy to follow steps. While you are drawing, don't forget to hold you pencil lightly so that your lines won't be too dark. 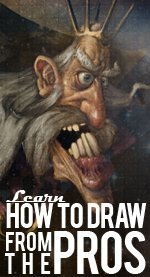 This is important so that you can erase any guide shapes at the final step to give you a nice clean drawing. Are you ready to get started? Start off by drawing an oval for the rabbit's head, and below that a "pear" shape for the body. Try and get the placement of these two shapes to look like the example picture. All we're doing here is adding three simple circles to the head, and two ovals for the rabbit's feet. Again, pay close attention to the placement of these circles, especially the ones on the face. The two smaller circles on the face will make up the mouth and nose area, and the larger circle will make a big puffy cheek on this cartoon rabbit drawing. First of all erase the overlapping lines from step two so that your rabbit's feed and head look like they do in this third example drawing. Next, give the rabbit big, floppy ears with two easy curved tube shapes. Note that the ears are much thinner where they meet the rabbit's head and get wider in the middle. Then draw a small circle for the nose, and some simple curves for the arms and carrot. To make the tail, just draw a half circle from the top of the left foot to halfway up the curve of the rabbit's back. We'll add some texture to the tail later to fluff it up a bit. Just a few curved lines add all the detail to the face. First, draw some upside down "U"s for the eyes, two more U shapes for the mouth and teeth, and then three straight lines on each cheek for the whiskers. Two slightly curved lines on each foot suggest toes. A squiggly three-fingered "hand" shape will add some stalk to the carrot. 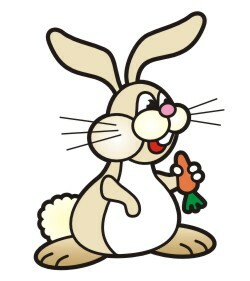 Once that's done, add a few circles along the sides of the carrot so that it looks like the rabbit is holding it. Draw a curved line that goes from the neck down to the cartoon rabbit's belly to show where the fur changes color from the hair on the back to the hair on the stomach. Finally, add some fluffiness to the rabbit's tail with several bumps.eraser work to get a more interesting wing shape.